How to Customize a RACI Chart? Current: How to Customize a RACI Chart? Unless your software development team is a one-man-band, there is a good possibility that the coding activity is divided into parts, responsible by different developers. Take software projects that apply three-tier architecture as an example. It usually involves three groups of developers, with each responsible for one tier. For instance, developer A implements a model class readily to be used by developer B who implements the controller. Visual Paradigm enables you to build chart. In addition to the built-in RACI chart available for general purposes, you can define your own type of chart for problem-specific purposes. In this tutorial, we will develop a chart to show the job division of a development team to show who implements or uses certain classes for an application. Let's study this case: When the model class has been updated to follow the updated requirement, the developers who use the model class shall look into their code, to make sure the implementation written before is still valid. This proves knowing who does what in a team is needed - who implements certain classes, and who uses these classes. In order to identify who implements or uses what classes, a responsible chart can help. Download Time Killer Mini Online Game.vpp. Open Time Killer Mini Online Game.vpp by selecting Project > Open from the application toolbar and selecting Time Killer Mini Online Game.vpp you just downloaded. Create a chart (diagram). 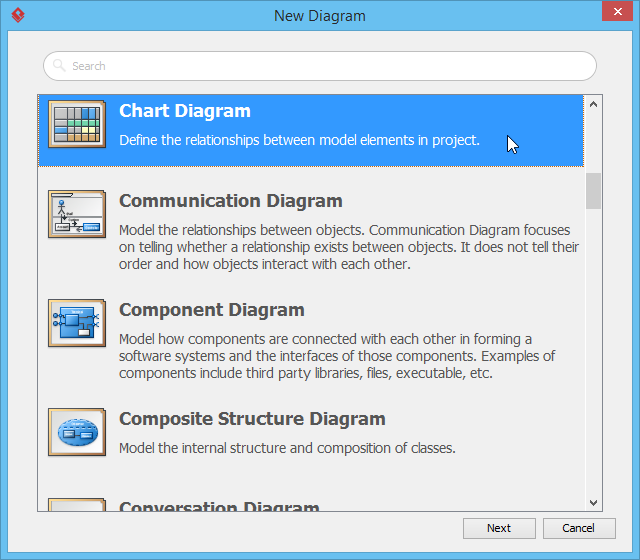 Select Diagram > New from the application toolbar. Select Chart Diagram and click Next. 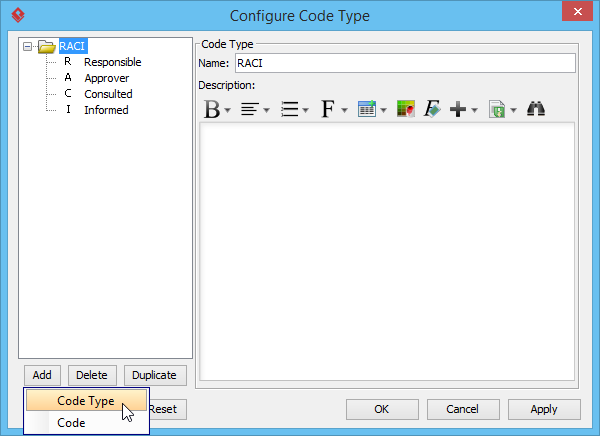 Apart from the built-in chart type, you can configure a new type of chart or modify the existing chart by clicking the ... button next to Code Type. 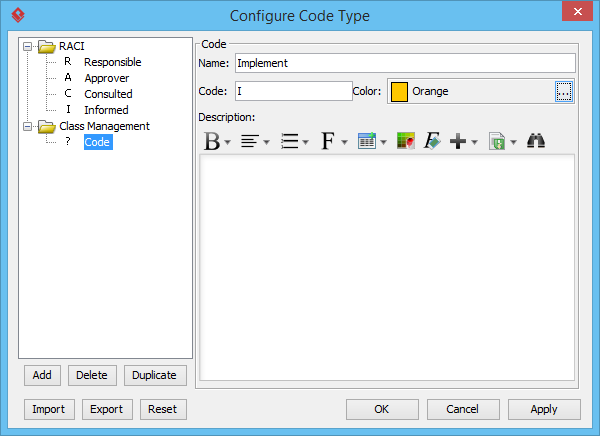 Let's configure a new chart type by selecting Add > Code Type from the drop-down menu. Name the newly created chart type as Class Management. 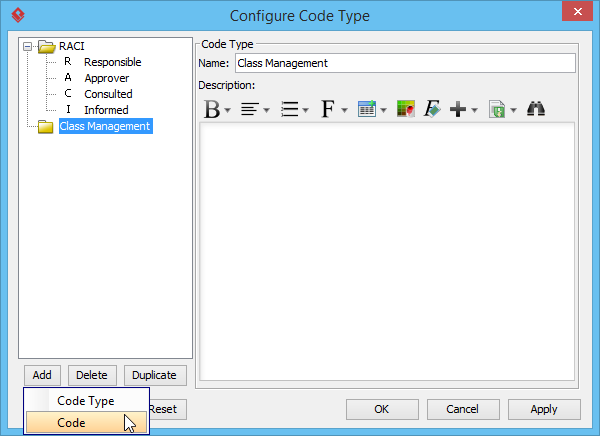 Next, configure roles for Class Management by clicking Add > Code from the drop-down menu. The added code, therefore, will be used as a role in the chart type. 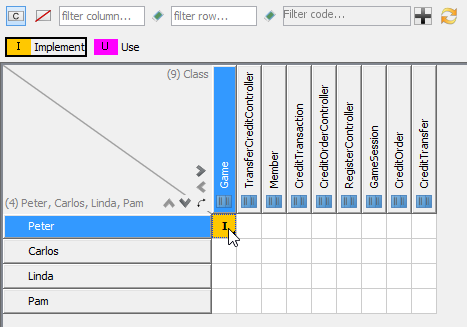 Let's define a role, Implement for the chart type by entering Implement in Name field and I in Code field. Click the ... button next to Color field and select Orange from the pop-up menu. Repeat step 6 and 7 to add another role, Use. 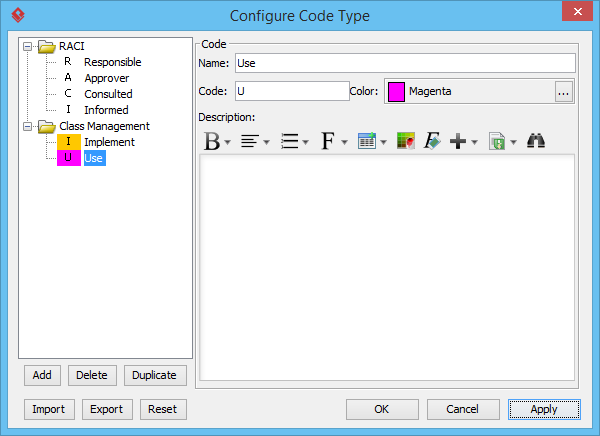 Enter Use in Name field, select Magenta in Color field and enter U in Code field. Now, we can create a responsibility chart. Name the chart as Class Management. The new chart type is created in Code Type. 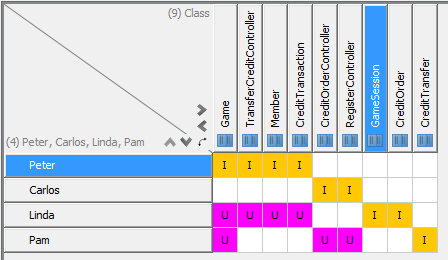 Let's select Class Management from the Code Type combo box to build a responsibility chart. Next, define team members who are involved in Class Management. 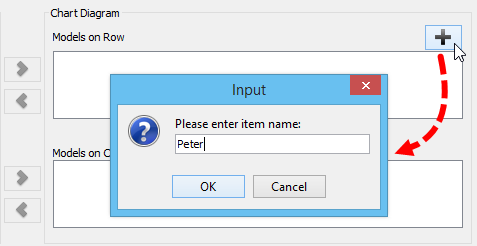 Let's define Peter as a team member by clicking + button next to Models on Row, entering Peter in the pop-up Input dialog box and clicking OK button. Repeat the previous step to add three team members: Carlos, Linda and Pam. 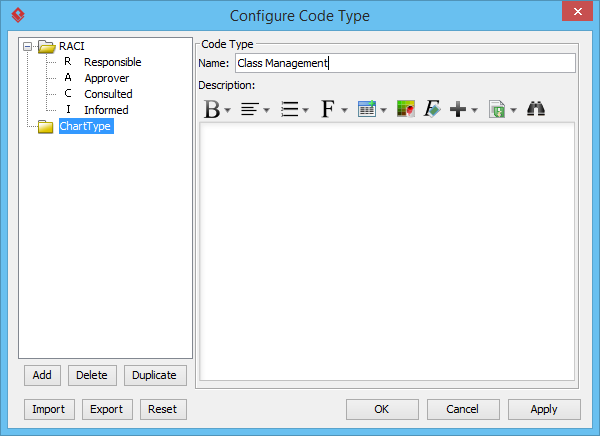 Let's specify a model element type taken in Class Management by selecting Class under Model Element Types tab. 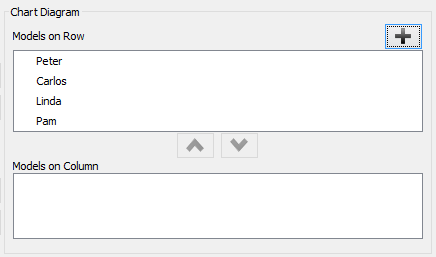 In Class Management, you can assign the specific role for each team member. Let's assign Peter to do Implement for Game by clicking Mark Code to Cell button on the top of chart, and then clicking Game.